On Monday, the New York City Council Committee on Contracts held an oversight hearing to examine serious and systemic issues facing human services nonprofits operating under contracts with the city. 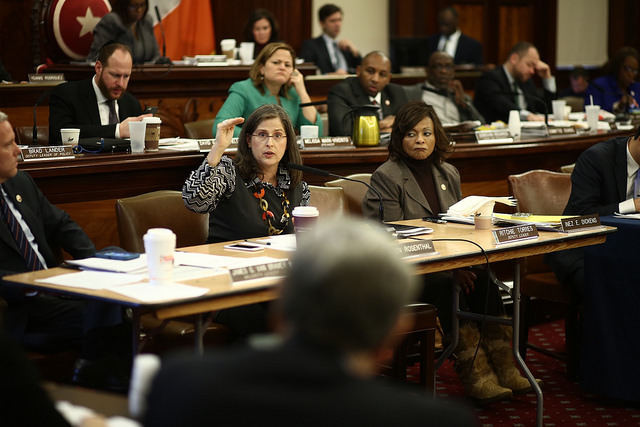 The hearing, chaired by Council Member Helen Rosenthal, was held in response to a report released by the Human Services Council (HSC), a coalition of 170 nonprofits that provide vital programs like childhood education, senior care, and job training to New Yorkers. The report identifies the major challenges facing the nonprofit human services sector, as well as recommendations to strengthen and stabilize it. Leaders from 25 organizations testified at the hearing, echoing the issues outlined in the report and painting the picture of a sector in crisis: government contracts account for the majority of provider budgets, but pay roughly 80 cents or less of each dollar of true program delivery costs, creating budget gaps and diminishing the quality of services nonprofits can provide; contract payment is chronically late, forcing providers to turn to costly borrowing to meet their organization’s needs, often accruing interest that is not covered by government contracts; and, programs are often developed without input from the human services nonprofits that are responsible for implementing them, resulting in “ineffective and unworkable programs,” according to the HSC report. The city is required to provide many of the support services involved, but contracts them out to nonprofits in order to save on costs and increase efficiency. According to the Human Services Council, the city’s human services nonprofits deliver “essential government services to 2.5 million New Yorkers” every year. According to the HSC report, the sector includes more than 200,000 workers and New York City is engaged in over 5,100 contracts worth $4.3 billion in the current fiscal year, which ends June 30. There are also thousands of state contracts that add another $1.5 billion in contracts. Many of these organizations rely on the government for almost all of their funding, and are told to seek grants or other funding methods to account for the rest of their expenses. The city often turns to outside providers to meet city needs, for instance, “When the city decides to build a $40 million bridge, they hire a construction company with that expertise,” Council Member Rosenthal said during her opening remarks. Not only do those contracts rarely cover the actual operating costs of the city’s human services nonprofits, but the payment is often late and unpredictable, creating an unsustainable situation that forces many of these nonprofits to take out loans from private banks in order make payroll and rent. “Do you know of any human services providers that have had to borrow from a bank in order to provide services?” Rosenthal asked Michael Owh, director of the Mayor’s Office of Contract Services, during his testimony. Owh said he didn’t have any specific examples, but knows that some providers have lines of credit. Rosenthal asked leaders from several human services nonprofits if they had been forced to take out a loan due to a lack of timely and sufficient funding, and eventually instructed Allison Sesso, executive director of the Human Services Coalition, to consult with her organization’s affiliates and put together a comprehensive list of how many providers have needed to borrow money. “We are often forced to borrow against a line of credit to meet payroll…last year, CAMBA paid $375,354 in interest for the use of our line of credit,” said Thomas Dambakly, chief administrative officer of CAMBA, a large Brooklyn-based nonprofit that provides employment, education, health, legal, and youth services. Several human services nonprofits have been forced to close in recent times, and a number of others are on the brink of insolvency. According to a report from SeaChange Capital Partners, a merchant bank serving the nonprofit sector, 18 percent of New York City nonprofits in the health and human services sector are insolvent, while the HSC report (created by a commission of 32 human services executives, civic and philanthropic leaders, former government officials, and others) determined that 60 percent of humans services nonprofits are financially distressed, with no more than three months of cash in reserves. In March of last year, after 80 years of operation, the Federation Employment and Guidance Service (FEGS), a “$250 million behemoth nonprofit human services provider, announced it would be closing; a clear signal that systemic issues threatened the survival of the sector as a whole,” says the HSC report. Before filing for bankruptcy, FEGS provided mental health, housing, disability, home care, and employment services to 120,000 households and individuals. As a result of FEGS’ closure, the city’s remaining nonprofit human services providers have been relied on to meet the needs of those 120,000 households and individuals who relied on FEGS services. If the city does not address the issues facing the sector, providers argue, the communities that these nonprofits serve will be the first ones to suffer the consequences. The HSC report and representatives from human services nonprofits who testified at Monday’s hearing put forward a number of solutions that could ameliorate the nonprofits’ dire financial situation. For one, the government could seek input from and collaborate with the human services sector while designing programs, which would ensure the creation of programs that the nonprofits are truly capable of implementing. Additionally, the government could issue contracts that fully fund nonprofits’ operating costs, including so-called “indirect costs,” or expenses like IT, building maintenance, accounting, and human resources, and fulfill those contract payments in a more timely and consistent manner. These contracts, human services workers say, should also account for cost increases that occur over time due to inflation or newly added mandates. Toward the end of the hearing, Council Member Rosenthal asked Sesso to return to the testimony table to answer a few additional questions. “Do you think it’s reasonable to ask the administration for some sort of roadmap or strategic plan for how you get from these recommendations to implementation?” Rosenthal asked. “At the heart of this is the rates, and it’s about what do we consider to be program costs...I do think that, [Mayor’s Office of Contract Services] would be a good partner, but there does have to be a directive at the very highest levels of the administration to do this.” Sesso replied.